NIFLA doesn’t believe so and recommends that Pregnancy Medical Clinics (PMCs) be aware of the errant methodologies of this study and be able to explain such errors to media-savvy pregnant women who question the safety of childbirth over abortion. As an example of the faulty statistics used by Raymond and Grimes, one need only consider California, the most populous state where almost 1 in 8 US residents live. California has no reporting requirements for abortion. Additionally, only 27 states require any type of abortion complication reporting, with 3 of the 4 most populous states not requiring this information. Further, Reardon provides evidence from research in Finland that clearly contradicts the Grimes article. Finnish researchers found that women are four times more likely to die in the year following abortion than women who give birth. Similar findings were reported in a record-based study of California women. Observe the graph below taken from Afterabortion.org regarding the study from Finland. 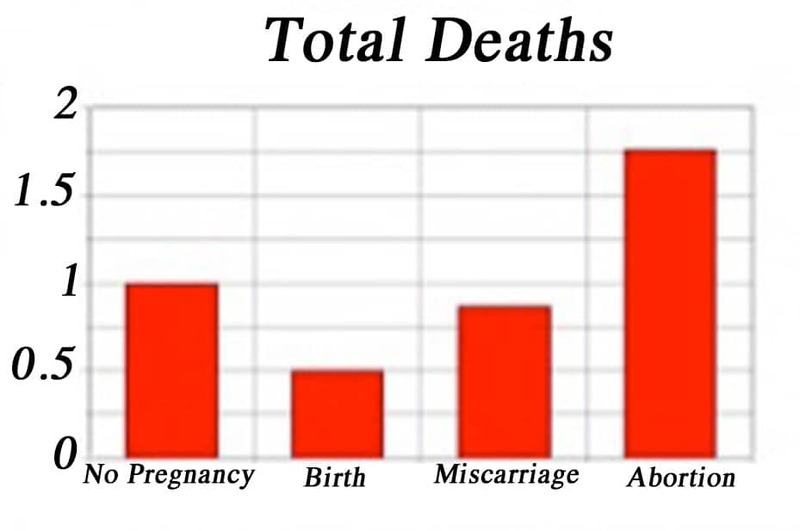 The figure above shows the age-adjusted relative risk of death in the year following a birth, miscarriage, or abortion compared to the rate of death among women not pregnant. The results are from a multi-year study of all women in Finland, linking death certificates to central registries for pregnancy outcomes. It clearly shows abortion is associated with an elevated risk of death, while carrying to term is associated with a lowered risk of death. In the PMC, it is important that medical information shared with patients by medical professionals should, when possible, utilize referenced materials, such as the ones cited below. PMCs and PRCs exist to serve mothers at risk for abortion with integrity and providing medical evidence based upon credible information. The Raymond and Grimes article is not credible. Mothers considering abortion deserve honest information. Providing them with copies of the articles listed here and providing information to access the websites where they are located is strongly encouraged.